If you're looking for sorting machines and advanced sortation systems, Walz Label & Mailing Systems offers automatic sortation solutions using SolidRoute™ from CASI, providing a high performance solution for distribution centers implementing sortation as part of the material handling system. Sortation systems range low to high speed as shown below. With any sorting machine, the parts per minute rate depends upon the item lengths, weights, conveyor speed, and required gapping between products. High speed sortation systems – 40 cartons per minute or less using a variety of methods such as urethane belt transfer as above. Low Rate speed sortation systems 100+ cartons per minute typically use a sliding shoe sorter as shown above. Distribution center operations can achieve a cost justifiable productivity increase by implementing a parcel / per carrier sortation system. Small item sortation can be accomplished with a variety of sorters depending upon the product type and sorting rate requirement. Walz Labeling & Mailing Systems and our partner CASI are experts in conveyor-based sorting machines and material handling solutions. There are many types of sorting machines and sortation systems for various applications. Many factors such as cost, speed needs, and type of products being moved will determine the best fit. Below are examples of the types of conveyor sortation systems we typically deal with. Many small to medium sized objects can be challenging to convey properly. Cosmetics and some pharmaceutical products are also prone to odd shapes and sizes. CASI has developed means to divert at 90 degrees without the sorter resetting to a home position, allowing a continuous directional sort without returning the mechanism each sort. Additional applications of continuous motion sortation systems include larger or irregular shaped cartons such as containers holding powders and grocery items. Consolidation sorting machines are used to consolidate single line items from multiple pick zones or full cases onto pallets. When a lower cost solution is needed for space constraints or current systems integration, cross belt sortation systems can provide wide flexibility in design, routing, as well as handle a wide range for product size and weight handling. This flexibility includes heavy cases, odd sized parcels, or fragile items. Cross belt sorters are also ideal for small parcels or envelopes where multiple diverts are needed for shipping lanes, totes, or bins. Sorting products on a continuous basis based upon a table lookup based upon the order. Continuous sortation systems require SolidComm™ to control the legacy host connection and SolidRoute™ to continuously assign lane numbers to the cartons. Fixed land sortation systems are normally accomplished with a PLC reading a lane number barcode previously applied in the pick area. There are many applications which do not require high throughput, thus saving you money on unnecessary equipment. Horizontal belt sortation systems are designed to handle medium rate sortation, typically around 60 cartons per minute and up to 300 feet per minute (FPM). 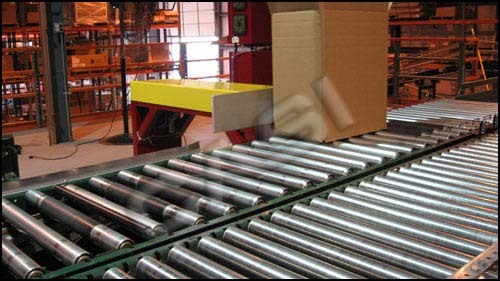 Applications of horizontal belt sorting machines include totes, corrugated boxes, or trays. 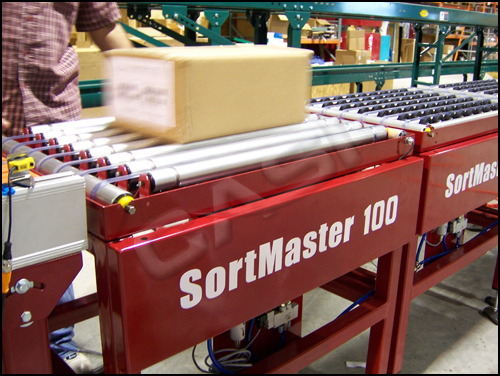 In applications with an internet or catalog model, a parcel sortation sorter must sort small orders of only a few pieces. These items are sorted by carrier and consolidated at the dock door. Also called Zone Routing, this method sorts split case pick cartons or totes to pick zones based upon the order. Zones without picks are passed without the carton having to divert to the zone. Walz utilizes shoe sorters in a variety of industries such as pharmaceuticals, manufacturing, distribution, and internet/mail order fulfillment. Cartons or totes may be sorted in a variety of ways depending on the application. Shoe sorters have proven to be effective at high speeds even with fragile contents such as electronics and cartons with glass. Walz has experience in multiple diverts for shipping lanes, reject systems for QC, and custom applications. Sortation of small items can be accomplished using a variety of sorters for Returns Processing, Zip Code Sorting, Parcel & and On-Line Pharmacy Fulfillment. Tilt tray sorters are ideal for small to medium sized items in medium rate to high speed applications. Typically tilt tray sortation is used to sort pieces into order bins where large volumes or waves dictate automation. This sorting system allows multiple sorting functions based on zipcode, product type, SKU, or other parameter that needs to be sorted. Walz will help you accomplish high speed and high accuracy requirements while greatly reducing labor costs and inherent mistakes found in manual sorting. Wave sorting machines are used for batch picking items. This is a common sortation system for delivery trucks loading by route and stop. Walz provides complete turnkey solutions for your conveyor sortation system requirements. From conception to installation & support, Walz can provide you with a system that will perform to specifications and can be supported with our industry leading customer service.